Figure 17 The Edit Section page. View: For each user type/group, if the checkbox is ticked, then a user of that type can View that data item in the current Section. Edit: For each user type/group, if the checkbox is ticked, then a user of that type can Edit that data item in the current Section. 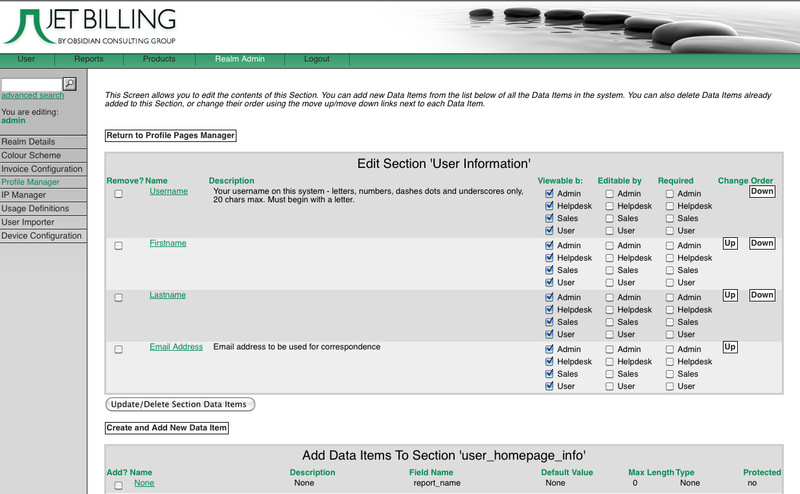 Required: For each user type/group, if the checkbox is ticked and the data item can be edited by that user type, then a user of that type MUST enter some sort of content into that data item. For example if you make the first name data item required and editable for Sales users, then a Sales user must always fill in the first name data item in that Section on that Profile Page. Change the order of the Data Items in that Section: Click on the [Move Up] [Move Down] hyperlinks next to the data item you wish to move. Create and Add a new Data Item: This is a short cut that takes you to the Create New Data Item page described in 4.1 and once finished adds the data item to your current Section. Add a Data Item to this Section: Select the data item(s) to add from the list at the bottom of the screen of all the data items in the system by checking the checkbox(s) for that data item(s) and then click the Add Selected Data Items button at the bottom of the page.